It wasn't a dream! When we woke up we were still in a serene room of whites and off whites and cactus leaves and quiet comfort! We eased our way to the pergola and the sumptuous breakfast buffet, a table burdened with goodness! Periangelo (the peacock) made his rounds with the guests hoping for a crumb or a smile. I swear that peacock knew when he was getting his photo taken ... preening and posing with dignity! We were surrounded by happy family noises in Italian, French, German and a language or two we couldn't identify and took our time at the meal (as Italians do!). First, we went to Alberobello. 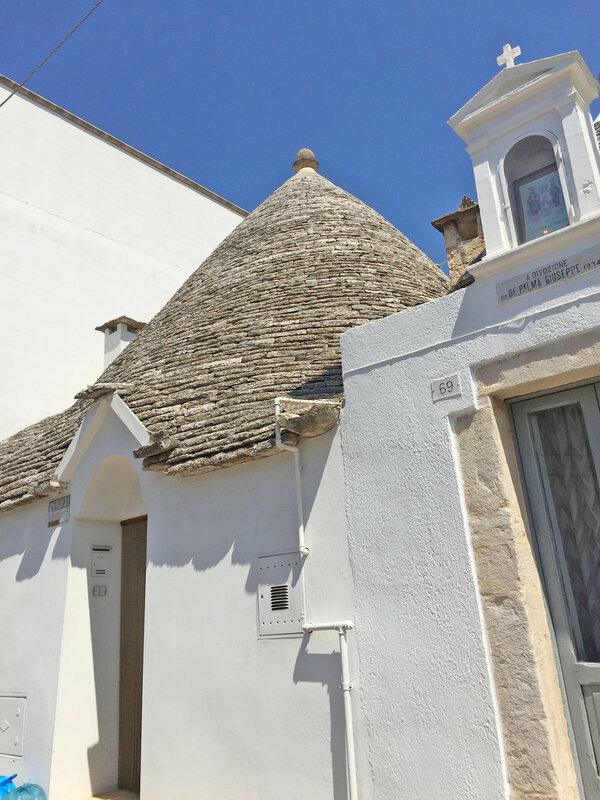 We had vaguely heard about *il truli* (buildings usually built of limestone with a conical roof and shingles made of sliced limestone), but were delighted when we saw these "fairy houses" in person. One explanation of their origin is that as taxation was high in the area in the 18th and 19th centuries, these homes were built as "temporary structures" that either avoided taxation because of their size or could be dismantled quickly. Some are built close together to create a multi room home. They are scattered around the area, but by far the greatest concentration of them are in this magical town. Not surprisingly the structures and the town are recognized by UNESCO as a world heritage site. We had a "light lunch" in the town square, sampling the traditional pasta of the area, orecchiette (which means small ears) and tomato sauce and broccoli. The shape of the pasta scoops up all the good sauce. Next stop, Ostuni. The side winding mountain to get to the town was an adventure all by itself. Ostuni, known as the "white town" for its white stone walls and lime washed buildings, is a beautiful example of a fortified medieval city. Dinner this night was in Monopoli, the main reason we came to Puglia on this trip. A very dear friend was born in Monopoli and sang the praises of the area so much we were committed to seeing for ourselves. We could have stayed in Monopoli for days! It is a warren of homes and shops and restaurants on the cliffs of the sea and filled with life! We ate on the top floor of a restaurant on the water, and then walked for ages among the crowds of people until Julian found a granita stand! And then we went back to our well-appreciated masseria for the night.